It is a wise saying that when the drumbeats in a wrestling ground changes its frequency to a faster rhythm and tone, the wrestlers also must change their wrestling prowess in order to become more focused, and ready to defeat each other's opponent. The leadership of the Indigenous People of Biafra, IPOB, had on Tuesday, June 19, 2018 announced its readiness to conduct a plebiscite in weeks to come, for the Biafran people to exercise their right to self-determination and determine their future as enshrined in certain Articles of the United Nations Charter for the rights of indigenous peoples of the world. 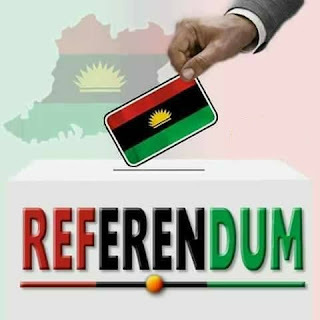 This is not time for jubilation; it is rather a very challenging and critical time in this struggle, for every Biafran, home and abroad, friends of Biafrans, and lovers of freedom to work assiduously towards recording a successful referendum. The task that lies ahead is enormous and we cannot leave it for IPOB leadership and family members alone. Therefore, every indigenous persons in Biafra land has a vital role to play and must get involved. The onus is on every Biafran to embark on massive evangelism, especially in the urban and rural areas of Biafra land where Radio Biafra signals is not yet covering. There are communities that are still groping in the dark about issues regarding this holy mission of the restoration of Biafra via referendum and we must take the message of light to them. This gospel of emancipation must be preached in every nook and cranny of Biafra land. Whether you are in Biafra land or in Diaspora, you can sponsor a referendum campaign in your hometown and other neighbouring villages in Biafra land, organize town hall meetings in areas you can. You can print referendum handbills, banners, stickers, T-shirts, bag, scarf, bangles and share in the market places, churches, schools, village and club meetings. Write letters to the Ezes (Kings) of your community, village head, women leader, youth leader and even hunters. I can state unequivocally, that this is the process that will usher us into the freedom that we have been fighting for since the uninvited guest (the British empire) invaded our land and enslaved us. This is the time to lay to rest the spirit of over six million Biafrans massacred, bombarded, raped and starved to death for our freedom. This is the time to free ourselves from this slavery, internal colonisation and planned extermination; this is the time to rise to fall no more. We know that our slave masters are not resting in their inordinate quest to continue to hold us down in their slave camp called Nigeria. However, we must make ready our spirit, soul and body, and prepare our minds for the difficult times attached with plebiscite. There is no retreat in our dictionary neither shall we ever contemplate to surrender. Biafra freedom is all we pursue and that, we shall get. “Land of the rising sun, we love and cherish thee”.